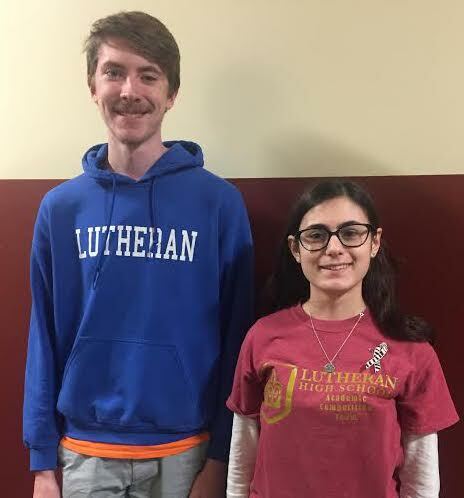 Indianapolis, Indiana – Lutheran High School of Indianapolis – The principal, Michael Brandt, of Lutheran High School announced today that Zach Murphy and Payton Bowling have been Commended Students in the 2019 National Merit Scholarship Program. A Letter of Commendation from the school and National Merit Scholarship Corporation (NMSC), which conducts the program, will be presented by the principal to these scholastically talented seniors. About 34,000 Commended Students throughout the nation are being recognized for their exceptional academic promise. Although they will not continue in the 2019 competition for National Merit Scholarship awards, Commended Students placed among the top 3% in the nation of more than 1.6 million students who entered the 2019 competition by taking the 2017 Preliminary SAT/National Merit Scholarship Qualifying Test (PSAT/NMSQT®). 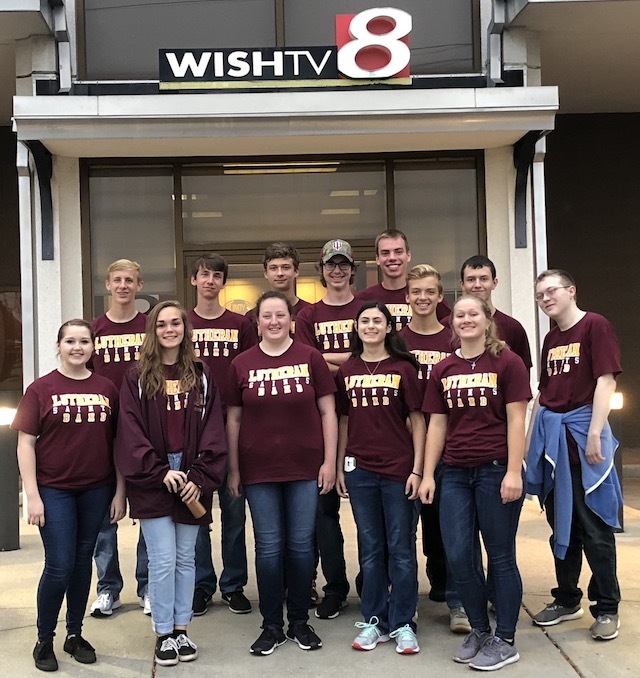 Indianapolis, IN – Members of the Lutheran Saints Pep Band performed LIVE on WISH-TV Channel 8 for their morning show promotion of THE ZONE. “The Zone” is a Friday Night High School Football Sports Feature. The band performed the LHS “Fight Song ” “Hey Song,” and “Go Big Gold.” The LHS Pep Band is led by Mr. Tom Wright. In and exhilarating game, the Lady Saints soccer team battled Herron’s girls soccer team! On the defensive end on the of the field, Hope Messer, Danni Underwood, Nhi Tran, and Abigail Leslie became an immovable wall to protect the goal. Gretchen Erdmann, Olivia Jackson, and Josie Sneed also played a fantastic defensive game including several charges to the ball to completely boot it out of the defensive zone! Mollie Graham, in goal for the first half and some of the second half, had many shots kicked at her that she skillfully saved from going in the goal. In the mid-fielder positions, Katie Miller, Cece Awrey, Alyssa Awrey, Taylor Scott, Anna Caster, and Elayna Brock sent the ball up the field to the forwards many times to keep the game going in the Lady Saints favor, but also sprinted back on defense when Herron was getting too close to the Lutheran goal. The forwards in the game, Lauren Hedges, Ellie Holwager, and Maddie Awrey took numerous expertly placed shots on Herron’s goalie. After Anna Caster, in right mid-field position, booted the ball to Katie Miller, in the position of right forward, each player could feel that something big was about to happen. Miller crossed the ball to Lauren Hedges, playing striker, and Lauren dribbled down the filed. Hedges breaks free of the last line of defense for Herron and takes a shot on goal. Unfortunately, the Herron goalie was able to catch the ball and save the shot. BUT WAIT!!! The Herron goalie dropped the ball after narrowly saving it and watched in horror as the ball rolled behind her and into the goal. The Lady Saints had scored a goal!!! The score was now 1 to 0 in the Lady Saints' favor! For the rest of the game, the Saints pushed themselves as hard as they could to keep the lead they had. At the end of regulation, your Lady Saints girls soccer team had come out with their first win in 4 years! Indianapolis, Indiana – Lutheran High School of Indianapolis On Saturday the Boys Soccer team celebrated Senior Day with a big win over Providence Cristo Rey by a score of 6-0. Senior Garrin Hartson scored two, Fred Hamer added one to his team high total, Luke Hughes also scored, and Mehki Franklin and Connor Ohl both scored their first career varsity goals in the win. The saints controlled the game from the opening kick. They poured 27 shots on the Wolves goal and had over 50% of the possession. After the game, Coach Ryan Baglow was proud of how the team possessed and moved the ball. He as well as all the coaches believes this could be a turning point for the Saints to kick off their run towards a sectional title. The Saints are back in action Wednesday when they go to Monrovia.